Choosing a razor for your Dad as a birthday gift or Christmas present is a very popular choice indeed. Every man shaves - even men with beards will eventually need to shave one day! So, choosing a razor which will both delight your Dad and offer many years comfortable shaving proves a very wise decision. Which is the best razor for my Dad? Plastic handles are too light and furthermore, feel very cheap. Ultra sharp blades glide over the skin so a weighted handle in hand is required to offer more control over the shave, resulting in less cuts and nicks. Wilde & Harte razors are manufactured from stainless steel. The mirror-polished handles feel weighty and luxurious, giving confidence to apply the necessary pressure to the blades and yield an excellent close shave. There are lots of uninspired designs available to buy at very inflated prices from retailers and online stores. The vast majority of razors are of a similar standard shape as they are cheap to manufacture overseas. Logos rub off and chrome plating eventually turns yellow. Even so called 'luxury razors' can start to look aged and dated within months. 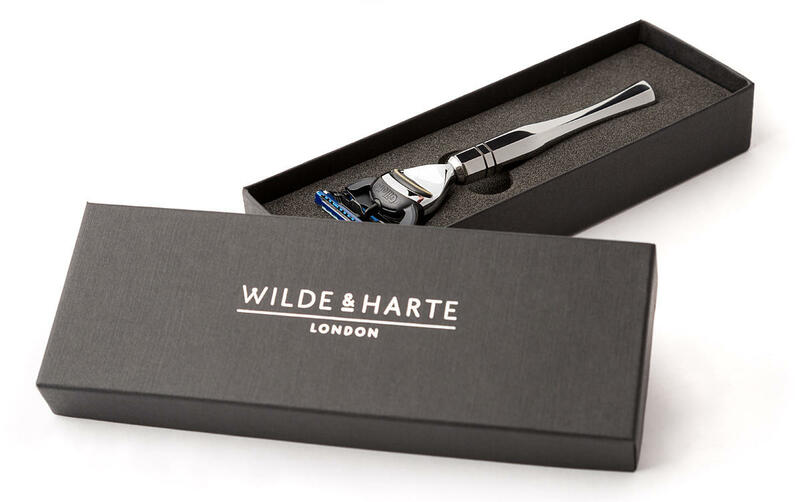 Wilde & Harte razors are made from durable, hand-polished stainless steel and available in unique, stylish contemporary or traditional designs - inspired by the grandeur of iconic houses and palaces in London. A branded enamel logo at the end of the razor not only adds to the feel of luxury, but like the razor itself, will last a lifetime. Above: The 'Eltham' Fusion razor in handmade gift box. A combination of plastic and chrome on the majority of popular razors may look new for a while - if looked after carefully - however, metal plating and plastics will dull, fade and corrode over time. Wilde & Harte razors are manufactured in the UK from premium quality stainless steel, then polished to an ultra bright mirror finish by hand. Stainless steel is an extremely durable alloy that does not corrode, rust of lose any of it’s high quality finish. Genuine Gillette components are used to ensure the longevity of each Gillette Mach3 or Fusion razor. Each Wilde & Harte razor is presented in a branded, handmade gift box. The logo is foil embossed on the lid and each razor sits in a luxury foam base to prevent movement during delivery. The British design and manufacturing industry is still amongst the best in the world. Wilde & Harte razors are designed using the latest CAD software, then manufactured in Sheffield using British steel. Skilled metal finishers hand polish each razor handle to an impeccable mirror finish. Every gift box is hand made here in the UK. When we say ‘Made in the UK’ we absolutely mean it! Online orders for Wilde & Harte razors attract FREE shipping to UK destinations and typically take only 2-3 business days to arrive. Simply contact us at your earliest convenience for further assistance choosing the correct razor. Expensive Gift Ideas for Men - What should you start searching online for when considering expensive gift ideas for men?